yes it is because this happen a long time ago. The story needs to be more descriptive. 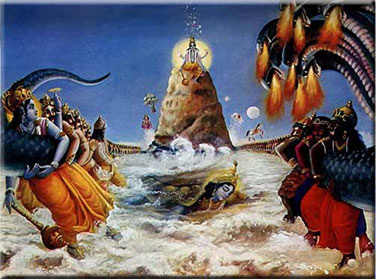 The character of Mohini which is very important is and puts major impact in the whole scenario of Samudra Manthan, is not disclosed. Secondly, please elaborate why the Mahakumbh is held in every twelve years and rest kumbh in every four years. Thirdly, in few stories it is defined that the Jyant(son of Indra) flew away with kumbh to protect it from demons, how far is this true? Thanks for the suggestions.I will edit this story. When was the latest mahakumbh organised (144 yrs) ? Thanks for knowing about Mahakumbhamela. But this is not a complete story. It is from sirmad bhagavat purana. No facts are suspected every thing is as it is. You can refer this book too. Indeed, even the maha-Kumbh is related to the spiritual Lord, Sri Vishnu, just as all rituals, rites, sacrifices, injunctions of the Vedas are related to Him directly or indirectly. Prayag is the King of all holy places because the three more sacred rivers viz. Gangaji, Yamunaji and Saraswati have their confluence here. All three are related to Sri Krishna. Ganga emanates from His lotus feet (as stated in Devi Bhagavatam, Srimad Bhagavatam, etc. ), Yamuna is His eternal associate and Sarasvati is His consort in the spiritual world, Vaikuntha. Same with the Cow, Tulsi plant, Geeta, and Brahmana. all four are considered supremely pure by every Hindu due to their association with Sri Krishna. Although all forms of God: Ram, Vishnu, Shiva and Durga and Their associates (Ganapati, Kartikeya, Kaali, etc.) are fully powerful, They have emanated from Sri Krisna. His associates take birth in Bharat-vursh again and again, and propogate the eternal tradition of Bhakti. Tulsidas, Meera, Surdas, Kabir, Tukaram, Bamakhepa. The list is endless. And then the Lord comes Himself, too. Sometimes He openly declares the inmost secret of Bhakti (like Gouranga Mahaprabhu) and sometimes He hides his intention, while secretly bestowing bhakti on vedantists and those who have merged in Brahm (like Ramakrishna Paramhams drowning vedantists like Totapuri, Vivekananda and Keshav sen in bhakti). Indeed, He is the greatest secret of all great secrets, and His special power (of Bhakti) is Supreme amongst all traditions (like gyan, Karm and Yog). I truly admire your devotion towards lord Krishna, and would suggest you a path way to reach him, and the path includes to adopt his qualities in your life, that would make him happy, mere praising him won’t add up anything to his glory, he is already glorified, its time for you to adopt his qualities and attain ur salvation.